Capcom is harnessing the power of the internet to introduce a whole new generation of gamers to Street Fighter 3: Third Strike. As if Marvel vs. Capcom 3 and the recently announced Street Fighter X Tekken weren't enough to get fighting fans excited, Capcom is re-releasing the much loved Street Fighter III: 3rd Strike as a downloadable title, presumably on Xbox Live and PSN. Speaking at Comic-Con, Capcom producer Yoshinoro Ono announced Street Fighter III: 3rd Strike Online Edition, saying that he hadn't forgotten the Street Fighter III series and intended to bring it back. He added that gamers shouldn't expect the game in the near future, as Capcom wanted to take its time with it. Interestingly, Ono also said that if fans had anything they would like to see in the game, they should tell Capcom Unity's Seth Killian, which suggests that this isn't just a straight port. 3rd Strike was released in 1999, and was the third iteration of the Street Fighter III series. 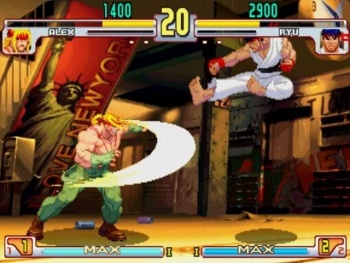 It has been released on consoles before, both as a standalone game and as part of Street Fighter Anniversary Collection. Street Fighter III was also the game that introduced characters like Dudley and Ibuki, who have since appeared in Super Street Fighter IV. Capcom seems keen on making its older fighting games available for download. It seems just a matter of time before the Alpha series makes its way to PSN and XBLA as well.